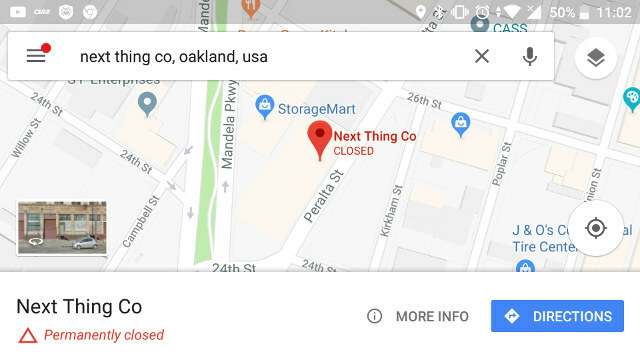 The Google Maps listing is not managed by Next Things Co themselves. I’ve left the rest of the post unchanged. Next Thing Co. introduced the $9 C.H.I.P computer powered by Allwinner A13/R8 in 2015, and worked with Free Electrons (now Bootlin) to bring mainline Linux and VPU support to the platform. They also launched PocketCHIP portable Linux game console based on the module, and lateron introduced C.H.I.P Pro WiFi + BLE module based on Allwinner GR8 processor, and found in their Voder (previously Dashbot) car dashboard assistant. I’m actually still using a C.H.I.P board as a printer server, but this morning I was made aware that Next Thing Co. may have closed shop with their blog and Facebook page gone, as well as the Google Maps page reporting the location is permanently closed. If you have order boards or modules from their website, or pledged to receive a Voder kit from Kickstarter, you may now have no hope of receiving anything. The forums are still up, but just in case, a backup is being prepared and may be posted on NTCfailure.com, whose owner appears to really upset by the KS delay/failure based on the Google Cache of this site. The person handling Next Thing Co twitter handle does not appear to have known about the closure, as he/she posted yesterday. Sad end to an open source focused company.